Get a gym membership. Drink less caffeine. Stop sharing cat pictures on Facebook. We all set resolutions for the New Year. It’s also the time to rethink the way your business will excite and engage its customers over 2016. Here are a few tips to help plan your company’s marketing resolutions for 2016. 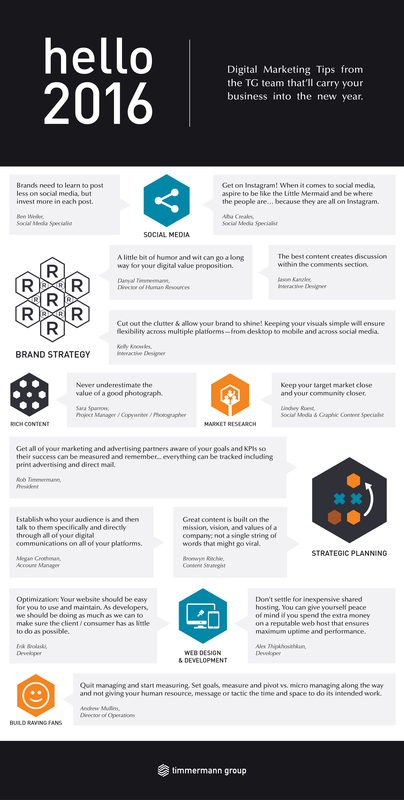 Click the ::ahem:: smartly designed image below to download the complete arsenal of Timmermann Group 2016 Digital Marketing tips. If you find yourself inspired to get started on your digital marketing workout regimen, contact us, and we’ll “personal-train” you to peak performance in 2016.